February 25, 2011. 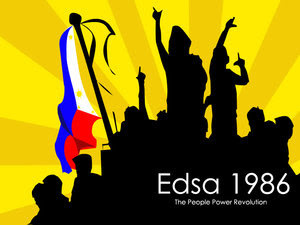 The Philippines celebrates its 25th Anniversary of People Power that took place in EDSA, Manila on February 25, 1986. This historical event is also called the EDSA Uprising. It was the time when our country needed a change of leadership from the brutal hands and dictatorship of the Marcos regime. Note: Please check 4 videos below. Ferdinand E. Marcos (September 11, 1917–September 28, 1989) became the country’s 10th President and ruled the country for 20 years. Senator Benigno Aquino (November 27, 1932–August 21, 1983), Marcos’ strong opponent, should have been our next President but things didn’t fall in the right places because Marcos put Aquino in prison cell for 7 years and 7 months. Aquino was then assassinated at the Manila International Airport (MIA) on August 21, 1983 after returning home from exile in the United States. He was 50 years old. (1) "Handog ng Pilipino sa Mundo" composed by Jim Paredes and arranged by Eddie Munji. Sung by various artists. (2) "Magkaisa" composed by Tito Sotto. Sung by Virna Lisa Loberiza. The airport was later named after him, and thus became the Ninoy Aquino International Airport (NAIA). In 2004, Ninoy Aquino’s death was proclaimed as a national holiday, known as Ninoy Aquino Day. 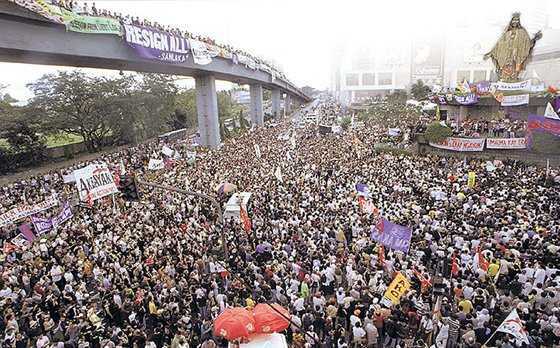 I was in Grade 3 when people flocked at EDSA to fight for our country's freedom. I can't even remember how many days our classes were cancelled. 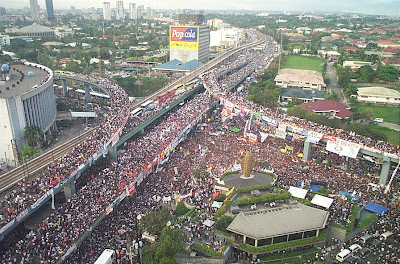 I wasn't in EDSA during that time, but I remember how people became victorious fighting for their convictions, with the support of the Catholic Church. Why did we have a Snap Election in 1986? 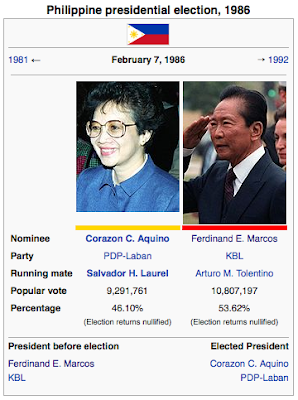 The Presidential and Vice-Presidential snap elections were held on February 7, 1986 in the Philippines. President Ferdinand E. Marcos and former Foreign Affairs Minister and Senate President Arturo Tolentino were proclaimed winners by the Batasang Pambansa as well as the official election canvasser, the Commission on Elections (COMELEC) thus granting President Marcos another six-year term as President of the Philippines. The electoral exercise was marred by alleged electoral fraud from both sides of the political fence as well as violence. Marcos and Tolentino won by over a million votes according to the COMELEC. The opposition headed by Sen. Benigno Aquino, Jr.'s widow Corazon C. Aquino and former senator Salvador Laurel refused to accept the allegedly fraudulent result. Due to the reports of fraud, the Catholic Bishops Conference of the Philippines (CBCP) issued a statement condemning the elections, the United States Senate passed a resolution stating the same. This chain of events eventually led to the resignation of Marcos' Defence Minister Juan Ponce Enrile and military vice-chief Fidel Ramos, who then decided to seclude themselves in the military and police headquarters at Camp Aguinaldo and Camp Crame respectively, leading to the People Power Revolution which precipitated Marcos's departure from the country into exile in Hawaii. 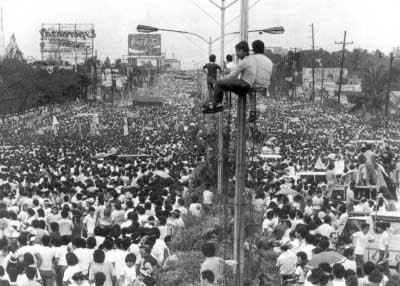 On March 24, 1986, the Regular Batasang Pambansa made a people's resolution signed by 150 lawmakers which nullified the election returns that proclaimed that Marcos and Tolentino as the winners. Instead, it mandated that Aquino and Laurel were the real winners of the snap elections. 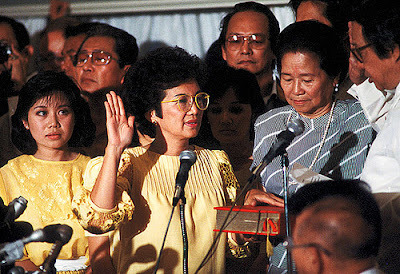 This is the original version of "Magkaisa"
The snap election paved the way for Benigno Aquino's wife, Corazon "Cory" Aquino, to become our 11th President of the Republic of the Philippines in 1986. Her running mate, Salvador H. Laurel became our Vice-President. This is Sarah Geronimo's version of "Magkaisa"